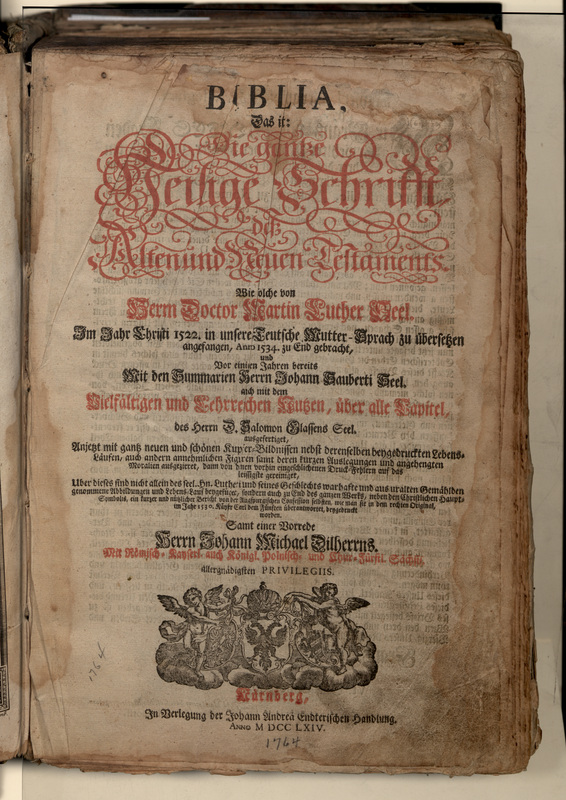 The Rimmler family bible was brought to America for Else Ruff (nee Rimmler, a family tree accompanies this) by Louise Hagner (nee Rimmler). After the death of Else and Louise, their personal effects, which included the bible, became the property of Roland Hagner. Because of my interest in the bible, Roland lent it to me. The title page is missing from the book and it appears that some of the early pages may also be missing. Family tradition has it that Else had a boyfriend or husband who was addicted to heroin. He cut the first pages out of the bible and took them to New York (about 20 miles away) looking for a book dealer to whom he could sell the whole book. Else found out about this and shortly threw the blighter out. He died shortly thereafter while a divorce was in process. Other than the missing front material, the first thirty pages are deteriorated, but most of the thirteen hundred some pages are in good condition. The outside cover is wood covered with leather, probably pigskin, which is dried and cracked. It had brass clasps, of which some remain. The binding is separated from the cover, but most of the cloth binding thread remains is fair condition. The book contains some handwriting on the covers and loose pages and is probably a history of the Reinhard family. School diplomas of the Rheinhards dating from 1821 were enclosed in the book. A list of the various material and translations and links are below. Below is a history of the bible and its printings, of which there were about 20 printings between 1670 and 1788. Without the missing pages it was not clear which edition it was. That led the author to search libraries in Germany and the US. I discovered that the typesetting of the text was the same in all editions, but there were differences in the artwork. Finally, aided by the Internet and helpful librarians I verified that the edition of our bible was from 1764. Here is the title page. [Title, 1 meg pdf. Title, 14 meg jpg.] I am currently restoring the bible using photographs of the missing pages supplied by the librarians at the University of Iowa. This is a good place to mention that in 20 years of looking for editions of the bible, librarians in the US and Germany were very helpful.